Spirited Away is a fantasy anime film by Studio Ghibli released on 20 July 2001 in Japan, and it is one of the representative works of Hayao Miyazaki. The story of the movie: Chihiro, a ten-year-old girl, and her parents were traveling to their new home when they get lost. Then she finds herself alone in the world of spirits, and tries to find her way back to the real world, while looking for her parents who were turned into pigs. ‘Edo-Tokyo Open Air Architectural Museum’ is the very place in Koganei City, Tokyo that director Miyazaki referenced when he designed the world of spirits for this film. Let’s go on an anime pilgrimage together! Let me introduce the five spots used as references in Spirited Away, in chronological order. The first spot is the bar where Chihiro’s parents were turned into pigs after eating piles of food in the beginning of the story. Its based on ‘Kagiya,’ an Izakaya bar at Kototoi-Doori (Kototoi Street) in Shitaya, Taitou ward, Tokyo, open since the end of Edo period. An izakaya is a Japanese-style drinking spot where you can enjoy alcohol and dishes at a reasonable price. This bar has been loved by the locals here since the end of the Edo period. The numbers of the menu on top of the photo are the old prices of dishes back in 1970. Chihiro’s parents ate big plates of food at the bar without asking and were turned into pigs. This spot is where Chihiro’s story started. Haku set up a plan to make Yubaba hire Chihiro. As a result, she loses her original name Chihiro, but instead receives a new name, Sen, and starts working at Yuya, or the bathhouse. Kodakara-yu in this photo is one of the models for that bathhouse. The lively scenes at the bathhouse with all the spirits as customers were based on these bath tubs and bathing facilities. The official website of Studio Ghibli also refers to this spot as ‘strongly inspired from’ to create the anime film Spirited Away. Kodakara-yu was built in 1929 at Senju-motomachi, Adachi ward as a public bathhouse. It run until 1988 and was loved by the locals. What is a public bathhouse? Many old Japanese house, and apartment buildings until the 1980s had no private baths or showers. There were many communal bathhouses called ‘sento’ in every town and people used to bathe there for a small fee. Since Japan has a lot of natural hot springs, some sento use hot water from a natural hot spring. For many Japanese people, bathing is not only for cleaning their body, but also a kind of entertainment. Being in a big hot bathtub makes you feel happy and relaxed. Nowadays, the so-called ‘super-sento’ is very popular in Japan: an amusement facility with an outdoor bath, sauna, bedrock bath, and massage facilities, where you can watch movies and TV or read manga, along with a restaurant where you can also enjoy food and drinks. 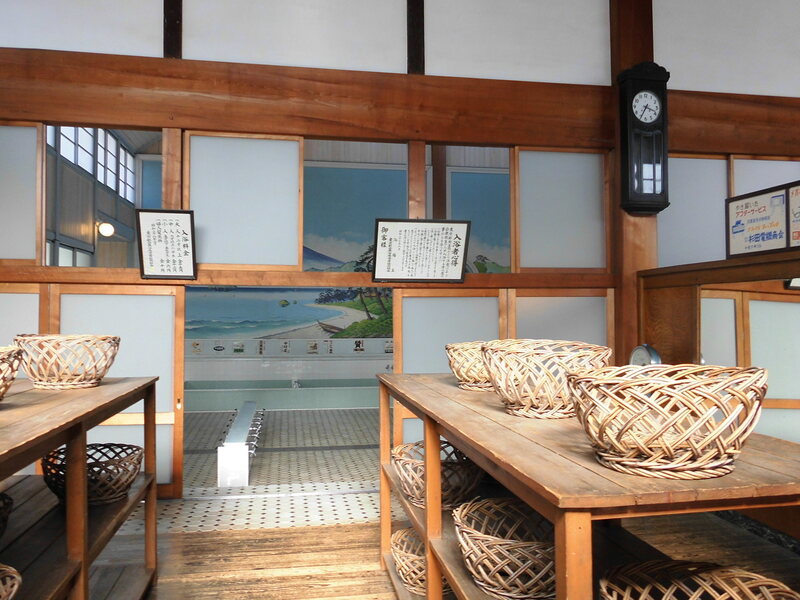 The bathhouse that appeared in Spirited Away is also a super-sento that let those Japanese spirits to be entertained. The brown building in the center is the Takei-Sanshoudou stationery shop in Kanda, Chiyoda, Tokyo, founded in the beginning of Meiji period, and it is the model of Kama-jii’s workplace in the bathhouse. It may not look like it from the outside, but it is the inside of the building that served as an inspiration for the film. Once you enter the shop, it definitely looks like the workplace of Kama-jii in the film. See the shelves on the left? These shelves are the ones Kama-jii used with his spider legs (or hands per se) to take herbs from. They actually store calligraphy materials in these shelves. The building, at whose window Chihiro was standing when an injured Haku dove through, is based on Korekiyo Takahashi’s mansion. It is where Korekiyo Takahashi was assassinated by rebels in ‘the February 26 Incident’ of 1936, an attempted coup by a group of young Imperial Japanese Army officers. The building was originally located in Akasaka, but was relocated here, partly restored, and has since then been preserved. If you have video or images of Spirited Away, please compare them with this photo. The window has the same frame design as the one Haku jumps into. Yes, it was based on the second floor windows of this mansion. The ocean train Chihiro took to meet Zeniba is based on the Tokyo Toden tram, once run in Tokyo. 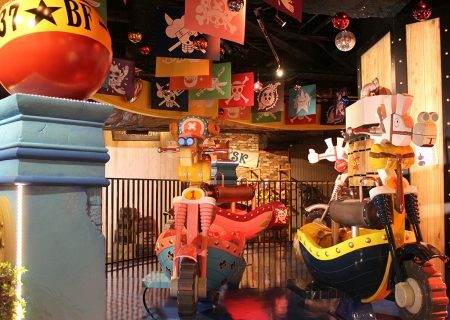 The train car was built in 1962 and used to run from Shibuya station to Shinbashi and Kanda. As Tokyo grew into a metropolis, most of the tram lines were abandoned for smoother automobile traffic, and currently only the Toden Arakawa Line, which connects Waseda, Shinjuku with Minowa, Arakawa, remains in service. No-Face and Chihiro sat in this very car in the film. Anyone can sit on this seat freely for fun. 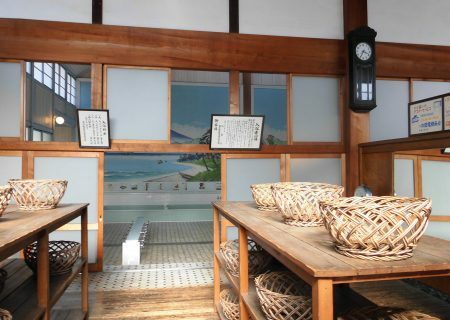 After enjoying the five spots at Edo-Tokyo Open-air Architectural Museum that are seen in Spirited Away, how about enjoying some musashino udon that Miyazaki also had for lunch? The East Zone of the Edo-Tokyo Open-air Architectural Museum has an udon-noodle restaurant called Kura, just next to Takei-Sanshoudou. They have my recommendation, musashino udon, as well as other dishes like daily specials, sweets, and drinks. To order food, just buy a food ticket from a vending machine and give it to a clerk there to receive your dish. I ordered the most popular dish, musashino udon. You can have it either hot or cold. I had it hot this time. Udon noodles are generally made from flour only, but this local noodle also uses soba (buckwheat) flour for dusting when making the noodle. You can enjoy both the flavors of udon and soba at the same time. It is served with a bowl of broth and udon noodles plus a plate of parboiled vegetables of white radish, seaweed, and green onions. You pour those veggies into the bowl and eat them together. The broth is so good that you could easily drink it all up. I discovered an illustration and a signature by Hayao Miyazaki, given to this restaurant when he ate here. It is framed, but the illustration and the signature were on a piece of paper, most likely torn from a notebook. He might have dropped by while he was planning for Spirited Away or some other project. 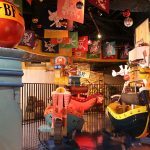 ‘Edo-Tokyo Open-air Architectural Museum’ is an open-air museum full of historical buildings of great cultural value that existed in Tokyo from the Edo to the Showa era. You can also enjoy the streets you often see in old anime series from the 1970s. To get there, take the JR from JR Shinjuku station to Musashi-Koganei Station on JR Chuo Line, and take the north exit. Take a Seibu bus at platform No. 2 or 3 nearby, get off at Koganei-kouen Nishi-guchi (Koganei Park West Entrance) and walk for five minutes. Or take a Kanto bus at platform No. 4 to ‘Edo-Tokyo Tatemono-en mae’ and walk for three minutes. Open hours: April to September 9:30 a.m. to 5:30 p.m.
October to March 9:30 a.m. to 4:30 p.m.